British submarines sent to Russia hunted German ships and disrupted vital supply routes for the Kaiser in World War I. The Great War is remembered primarily for trench warfare in the killing fields of the Western and Eastern fronts. However, the much-expected sea battles between the two greatest navies of the time, the British Grand Fleet and the German High Seas Fleet (reorganised in the early 20th century by Admiral Alfred von Tirpitz), never really happened, with the exception of the battle of Jutland, where both sides claimed indecisive victory. Otherwise, Admiral Tirpitz’ baby, on whom Berlin had lavished huge sums of money, mostly shied away from taking on the established master of the seas. Yet in the Baltic, which the Germans considered a safe backyard for their navy, they suffered some painful losses thanks to a wartime alliance between British and Russian submariners. The Baltic Sea was not just a German training ground but a vital route to replenish German war supplies of materials from neutral Sweden. The Royal Navy’s objective was to impose as full a blockade of Germany as possible to starve it of vital supplies. Without the Baltic, the blockade was incomplete. But Germany ruled the waves there. Russia’s Baltic fleet, whose much needed modernisation was stalled by the outbreak of hostilities, was no match for Tirpitz’ expensive toys. However, one imperial submarine, the Akula (“shark”), was the largest in the Tsar’s fleet, at 400 tons, and was thought to be the first in the world to be capable of firing multiple torpedoes. To complete the wartime blockade and shore up Russian naval defences, Britain decided to sneak in a small flotilla of submarines to serve under Russian high command. 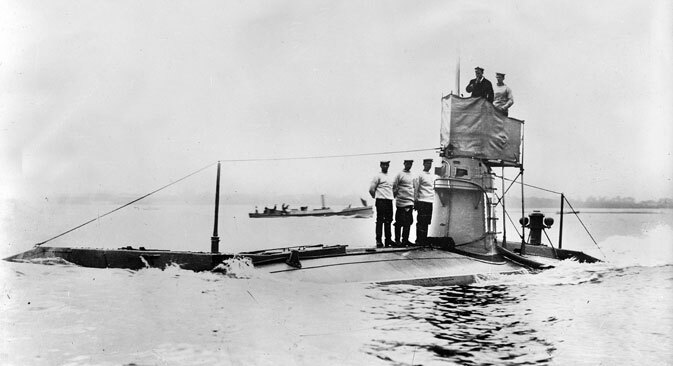 Between October 1914 and September 1915 four British E-class submarines slipped through the narrow and shallow Danish straits by shadowing neutral merchantmen and escaping close brushes with German warships. Four smaller C-class boats were also towed around the North Cape to Arkhangelsk from which they were transported on board of Russian barges through an intricate system of canals and rivers to the Gulf of Finland. The Russians tried to keep the arrival of the British submarines at the Russian base of Reval (now Tallinn, capital of Estonia) hidden. They insisted that the boats should not fly the Royal Navy flag, their ID numbers should be painted over, and their crews should wear civilian clothes onshore. The British disobeyed; and eventually, when the Germans discovered their presence, Berlin stopped exercising its big warships in the Baltic. Soon after the British arrived, winter set in and the icy seas made it almost impossible to engage in any real action. To keep warm, the sailors soon were running low on their rum rations, and Admiral von Essen, commander of the Russian Baltic Fleet, suggested that they switch to vodka instead. The British proved a match for the Russians in this respect. They also shared the same quarters with the Russians and learned to play Russian billiards and to ski during the long winter inactivity. There was even a football tournament among British and Russian crews. The Russians were especially taken with the commander of the E-9 submarine, Max Horton. His larger-than-life character and a taste for a good drink and good company earned him a lot of friends. During the war, the boat under his command sank and damaged a good number of ore transports, as well as several German warships. The joint patrols by Russian and British submarines severely disrupted shipments of vital supplies to the German war machine. After almost a dozen cargoes went down in just a few weeks, shipments were halted until the Germans developed a system of convoys to protect their cargo. Many of those crucial kills were achieved by a single sub, the E-19 under the command of Francis Cromie. He sunk four German transports in one day. What is more astonishing is that Cromie went on to become a de-facto commander of the Anglo-Russian submarine flotilla during the meltdown of the Russian military following the overthrow of Tsar Nicholas in February 1917. The Russian sailors, agitated by the revolution, preferred to listen to him than to their own officers, many of whom were literally thrown overboard. In May 1917, Cromie, a fluent Russian speaker, was appointed naval attaché to the British Embassy in revolutionary Petrograd. It fell to him to arrange the evacuation of the submarines to Finland after the fall of Reval to the Germans, and the subsequent scuttling of the boats when German forces intervened in the Finnish war for independence from Russia. The British crews made it safely back to Britain, with the exception of E-18. She had failed to return from patrol in May 1916. Goodhart wrote that the E-18 commander, Robert Halahan, had his future told by a local woman who warned him of great danger. The superstitious Halahan asked the wife of the British Vice Consul in Reval to send a message to his family ahead of the official Navy telegram if anything happened to him. The Tsar posthumously awarded top military orders to Halahan and two other officers, with every member of the crew being honoured with a medal. What happened to E-18 was long a mystery until, in December 2009, its wreck was found by Swedish divers off Estonia, not far from her base. Her open hatch suggests that she was sailing on the surface when she probably hit a mine. With time, the exploits of the small British submarine flotilla in the Baltic were largely forgotten. Yet Anglo-Russian naval camaraderie had disrupted Germany’s war supplies, denied the German High Seas Fleet a safe training ground, and offered a counter to German propaganda that Britain was failing to support its Russian ally.